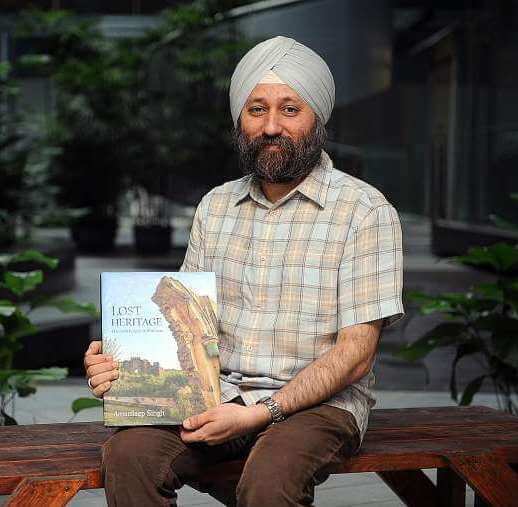 Amardeep Singh has travelled across 126 cities and villages in Pakistan and documented the remnants of the Sikh legacy for posterity in two books titled, ‘LOST HERITAGE The Sikh Legacy in Pakistan’ and ‘THE QUEST CONTINUES: LOST HERITAGE The Sikh Legacy in Pakistan’. This research is a first comprehensive attempt in seven decades. The objective of raising funding is to enable placement of the two books set in the libraries of Schools and Colleges across India, in institutions across Pakistan and libraries across North America. This is aimed to enable the youth reconnect with the glorious past of the dispersed Sikh community that is now deprived of access to their ancestral lands. It also aims to make the world aware of these lost chapters of the Sikh legacy. On DVN, our current goal is to raise enough funds to place 150 books. 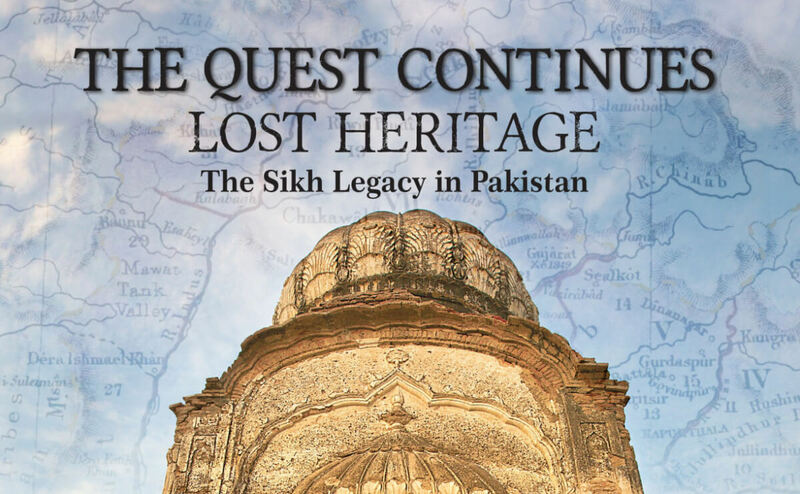 This is to thank you for your support to place in libraries of institutions, the two volumes of the books, 'LOST HERITAGE The Sikh Legacy in Pakistan' and 'THE QUEST CONTINUES: LOST HERITAGE The Sikh Legacy in Pakistan'. We had established a target of placing approximately 500 sets of the the two volumes. Below is the break-up by geography, of where the boks have been placed. The project now stands closed. We have now completed the distribution of 100 sets of the two books on 'The Sikh Legacy in Pakistan' for placement in the libraries of institutions across Pakistan. 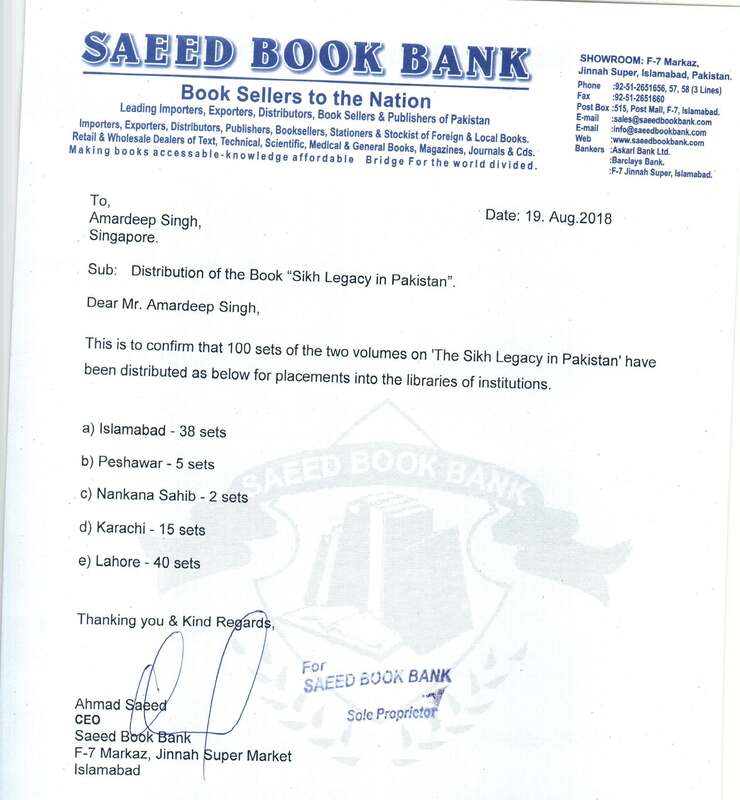 Please find attached, the letter from 'Saeed Book Bank' detailing the distribution within the country. In parallel, we have now completed the placement of 75 sets across Sikh institutions in Delhi. The next wave of placing 52 sets in the major libraries of the non-Sikh institutions across Delhi is currently underway. Also the placement of 230 sets across East Punjab and Chandigarh, in partnership with Dilbir Foundation of Amritsar, is around 30% completed and they need another 2 months to be able to place all the sets. We are currently fundraising for WAVE 2, and ask for your support. To make another donation, click here! I once again thank you for your support to make these books available widely across the institutions of Pakistan, which will help them become more aware of the remnants of our legacy. A quick update on the placement of the book sets, Sikh Legacy in Pakistan, at institutions across Punjab and Delhi. A fresh stocks of books have been received from the press. We will ship 230 sets to Dilbir Foundation in Amritsar, who will be placing the books across East Punjab and Chandigarh. Also, 75 sets will be provided to the Delhi Sikh Gurdwara Management Committee to place in the libraries of the institutions they manage. A total of 300 sets will be placed under this wave. Dilbir Foundation will physically place each set by deputing their resources to travel across Punjab and Chandigarh. We expect them to finish the placement of 230 sets by the end of October. We will also be supplying 75 book sets to the Gurdwara Rakabganj and their staff will visit each location to place the books. The process will take 1 month from the time they receive the books. Thanks once again for your support towards this initiative. We're less than $500 away from our goal, to make another donation click here. Please consider making a donation to help The Sikh Legacy in Pakistan reach its goal. A donation of any amount goes a long way to support the work being done. Thank you for empowering and fueling the work of the Sikh sangat!